Ever find yourself ready to tear your hair out wondering how to keep up with the laundry? Me, too. Like doing the dishes, it seems, like the instant you’re done it’s time to start all over again. To make matters worse, until recently I was the only person in my house who knew how to do laundry. So weekends would find me sorting, washing, and folding while everyone else slept in or went to do something fun. And if I decided not to spend the day washing clothes? Sure enough, Monday morning I’d wake to my husband and kids whining about having no clean underwear. It wasn’t fair, I tell you. So that’s why I came up with the printable routine below. With it hanging in a frame on the wall of the laundry room everyone in the house can pitch in. 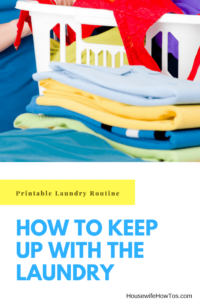 If that sounds like a dream to you, read on then grab my free printable routine about how to keep up with the laundry so your family can pitch in, too. Every hamper has a stain stick attached. I tie one end of a string to a Resolve Stain Stick, and the other to the hamper. As we undress, we check for and treat stains. This saves me a lot of headaches on Laundry Day. Use a sorter in the laundry room. I bought this sorting hamper and love how sturdy it is. Also, it has four compartments instead of the standard three. On laundry day there’s no need to spend time sorting because it’s already done. Do laundry at least twice a week. I wash sheets, pillowcases, towels, and washcloths on Mondays, so we start the week with clean linens. Clothing usually gets done on Fridays though we’ll run a load during the week if one of the hampers is starting to get full. Know the length of your wash cycles. My washer takes 25 minutes for a full load. Knowing this, I’ve built it into my daily cleaning routine, just as I’ve built in the time to switch from the washer to dryer. If you work outside of the home, start a load before leaving for the day, switch it to the dryer when you get home, and fold it as soon as it’s dry. Speed up drying time. Remove clothing items from the washer one at a time, giving each a good shake before tossing them in the dryer. This helps reduce wrinkles and makes sure your clothes can freely tumble-dry, so they’ll dry faster. Remove from the dryer properly. Don’t simply haul the entire load of clothes into a basket. That’s how stuff wrinkles! Take items out one at a time, immediately hanging anything that needs it. Once you’ve got things hung, you can fold the rest. 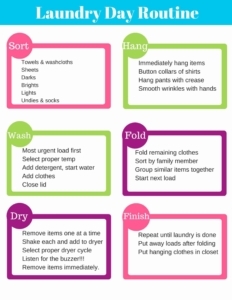 Sort items as you fold them. 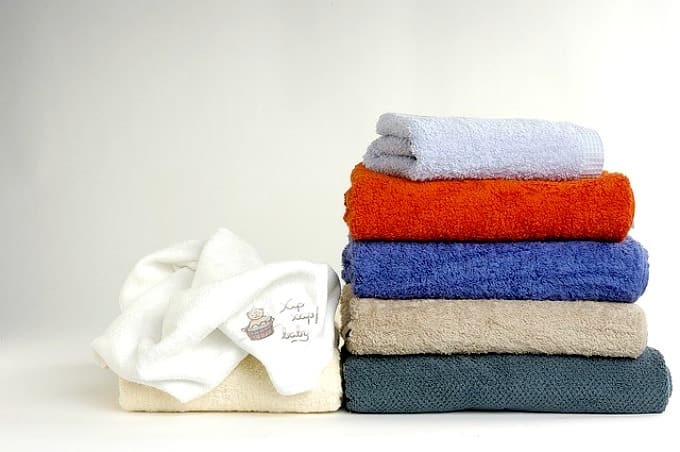 Sort each family members’ clothes as you fold them, and make separate stacks for bathroom and kitchen towels. Now you only have to make one trip per room to put things away. Put away each load as it’s done. Don’t wait until you’ve finished all of the laundry to put things away! If you want your kids to put their clothes away when they get home from school, put their stacks where they’ll have to take care of them. (Stairs are perfect for this.) But out everything else away as soon as it’s dried rather than continuing to pile it on the sofa or kitchen table. Want an easy way to put it all together? Help yourself to my free printable Laundry Day Routine! I love your tip to put away each load as it’s finished. I feel a little stupid for never having done it this way. You’re absolutely right that taking the 3-5 minutes now to fold and put away a single load saves so much head-ache from the usual frustration of 3-5 loads sitting in towering piles (that ultimately fall over and must be re-folded) that take forever to put away. I also love your tip that laundry isn’t “done” until it’s put away. Both tips are a little bit life-changing. Now if only I could get my other half to follow them… Any tips for house-training men who still want to live like college-aged bachelors? The best part of putting each load away as it’s finished is having the ability to stop if you need to without your sofa or table looking like a wreck. And it really does only take a couple of extra minutes. As for house-training men, you’re not alone in your frustration. I wrote a response to one reader who was having the same problem. break of a day or two before starting again. You’re on top of it, Keebelf, well done! Sorting it through the week really does make a big difference, doesn’t it? I used to wash tiny loads of brights only to wind up spending the whole weekend catching up with socks/undies and darks. Sorting really made a big difference for me. I’m glad you’ve found something that works for you! I have that hamper, and actually keep it right in our bedroom so we sort immediately upon getting undressed (ATM there is only two of us, so it’s easier that way). Great tips! I also love the stain remover stick. Thank you! Isn’t that hamper the greatest? I love being able to just bend over and grab a properly sorted load to throw in the machine when I have time. Glad you like the stain stick tip, too! Have you seen this? If I can ever get the rest of my house in order, I’m building it. Love your aunt Edna mention… ha-ha. I’ve solved it that way that in my laundry room are three laundry carts with four bags each (+ pouches for socks etc). So sorting is easy. Bringing it downstairs from the bed- and bathrooms helps organizing things. Bedlinens go straight from the beds into the washer. Shaking things out and hand-dry for easy and immediate ironing is a must. If I cannot for some reason iron my bedlinens, I fold them neatly as they come hand-dry out of the dryer and place them in a laundry basket inside the freezer. YES, that is a great and neat way of solving that problem. Take the basket out and within half an hour you can iron it away easily. No wrinkles and not a chore you will dread. For towels I wait till I have a load of them as I only wash towels separately as they will cause pilling on other items. Keep up your great posts as there are so many useful tips and hints! Wow! What a great post to come about on laundry day. I never thought about timing the wash cycle and have been known to forget the clothes down there for longer than I should and end up re-washing the same load the next day. I will definitely be giving that tip a try. Thanks, Jean! Hope the timer solution helps. Love this! Never thought to keep the stain stick with the hamper. Then I wouldn’t miss stains! Sara, that stain stick is a lifesaver! These are some great ideas. One thing I do is I fold stuff straight from the dryer. It saves a step and I am all about saving steps :). Thanks, Anne! Folding straight from the dryer is a great idea. I take mine to the kitchen to do it, though, because my cats’ litter box is in the laundry room and, well, it’s not a pleasant place to be no matter how often I scoop and sweep!